From 2013 to 2014, the Jim and Robin Herrnstein Foundation has given two grants to Stony Brook University for infectious disease research and the Madagascar dental mission. In the end of April 2014, Stony Brook University received a $60,000 grant from the Jim and Robin Herrnstein Foundation to support the Madagascar dental mission in the Madagascar Outreach Project for the next two years. The Madagascar Outreach Project is part of the Madagascar Ankizy Fund, a non-profit organization through the Stony Brook Foundation that builds schools and provides temporary healthcare to children in remote areas. Since 2005, Stony Brook dental students and faculty have traveled to Madagascar, located off the coast of Southeast Africa in the Indian Ocean, to provide oral health and nutritional counseling to impoverished villagers, primarily children. Each year more than 1,000 patients in Madagascar are benefited from this project. The island of Madagascar is among the ten poorest countries in the world. Stony Brook researchers’ effort will lead to break the cycles of poverty and disease in developing countries such as Madagascar. The Madagascar Outreach Project provides an opportunity for Stony Brook scientists to stand in a special position to address complicated relationships between health, birth rates, and economics in hopes of saving many lives. In addition to the $60,000 gift for the Madagascar Outreach Project in 2014, the Jim and Robin Herrnstein Foundation donated $3 million in 2013 to help establish the Center ValBio at Stony Brook University for infectious disease research. Center ValBio’s state-of-the-art research facility allows Stony Brook researchers to extend their interest in global health to dental care. The research facility is now home to conservation biology and infectious disease research programs. The Jim and Robin Herrnstein Foundation is one of the most important private research sponsors for Stony Brook University, but the majority of research funds at Stony Brook University, or 77% of its total research funds, comes from federal funding. This breakdown of last year's research funding at Stony Brook University indicates the ongoing dynamic research in this institution. Laboratory supply companies can help researchers at the Stony Brook University work more efficiently and effectively by promoting the best and newest research tools and equipments to them. 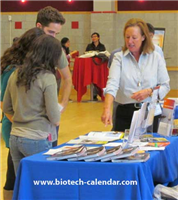 Biotechnology Calendar, Inc. provides an opportunity to do so at the BioResearch Product Faire™ Event on October 2, 2014. 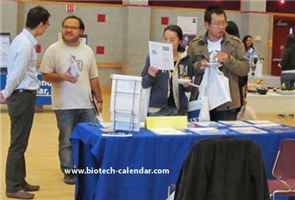 This year’s event is the 9th BioResearch Product Faire™ Event organized by Biotechnology Calendar, Inc. at Stony Brook University. Each year more than 220 research professionals attend this event, 27% of whom are professors and lab supply purchasing agents. If you are a laboratory supply company, and would like the opportunity to network with life science professionals at the Stony Brook University, please click the button below for more information about the BioResearch Product Faire™ Event on October 2, 2014. Biotechnology Calendar, Inc. organizes more BioResearch Product Faire™ Events at different institutions throughout the nation. Read the National Show Schedule for 2014 for more show information.